It is easy to remember those days when I started Second Life. I was at home; it snowed outside, in the mountains more than half a meter fresh and I had to stay home because of a terrible cold. Bored and because SL was a hype in our news, I downloaded and installed the client software. 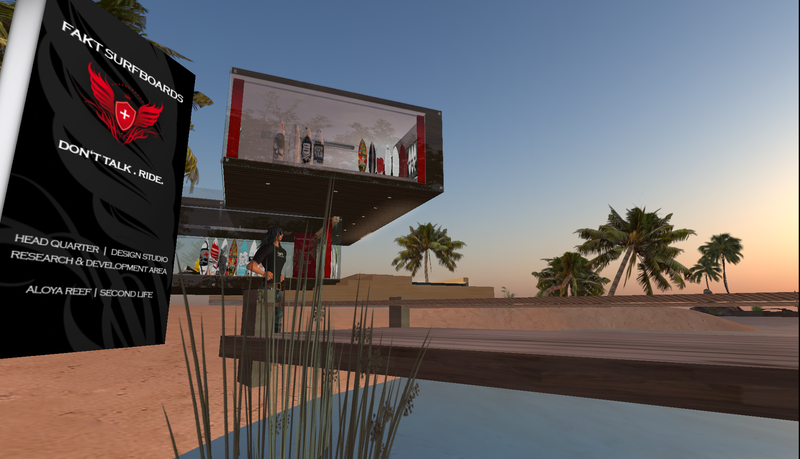 Just to know what is behind it, because some of my customers asked me about “What can we do in SL? Do we have to go there?”….. So I registered and stand there in my newbie look trying to walk. It was terrible lag and I logged out after an hour. The next day I logged in again. As an RL snowboarder, skateboarder and mountain biker I try to find something interesting, also in music. I went to Phat’s … wooow.. Those women there... I was impressed but looking too bad to go in and I didn’t really know how to “wear” a tuxedo. So I try to do something with sports. Days later I found Quan Li, and was stoked about that little short and incredible laggy place. And then for the first time I “talked” in Second Life. I met surfers like Craig Stallion, Thor Bishop (R.I.P. ), and surfer girls like Desne Aabye, Devinna Toll and Rani Decosta and a bunch of other crazy riders. We just had fun riding…. 5 people the same 4 second wave, fliping and whipping out, cause we would hang in each other’s board. Or the lag would catch us or the graphic card didn’t want to work no more. It was a peaceful and lovely time. Good to remember. 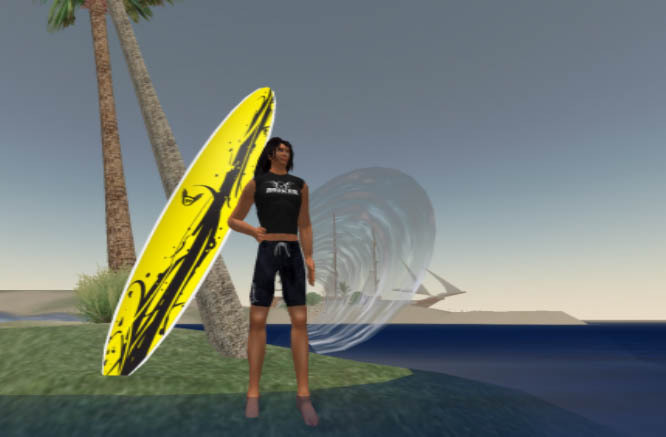 I surfed a Namiko Glory (Respect to Keala) and later a GR Murder Williams, wearing my first self-made “Alprausch” T-shirt. As a web and graphic designer I was fast interested in creating my first and own styled surfboard. Then the next, more, one more, one for a friend, one more, and I loved that people love the boards. Nice surf spots with much faster and less laggy waves were around: Sunset of Pova and later of Devi and Rani, West Ireland, but most I loved La Bahia. Bahia had a 3 section tube; Flynn Sheridan was a cool surf freak, always wearing a sarong. 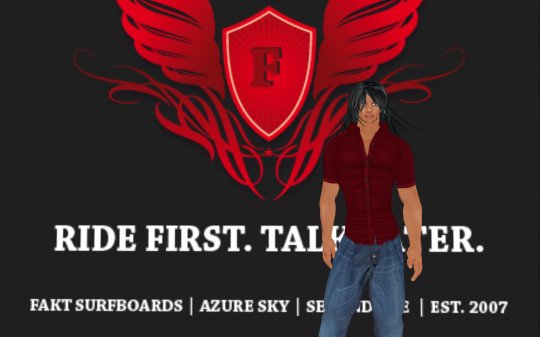 SSI was of course the only scripting company with a serious system, so I contacted Heather and within a short time, the first FAKT Line was available and I never expected it but over 500 people have bought a FAKT surf board. THANK YOU !!!!!!!!!!!! Desne and Pova founded AZURE SKY which was for more than a year my home and also a place for my store and design studio. But 2008 brought a lot of drama…wedding mania and B.S. come to SL… and lots of people around, and my RL biz was much (thx god!) and I took myself aback, and just went in to SL for surf. and from time to time I made some designs, for myself and friends. Jan 2009 in meet this red-haired, wonderful and so lovely girl – it was pure surf love from start. She inspired me for doing a lot of designs and to go on with FAKT. Baby Bel, Cat, Desne, Pova, VW Sands & Lissa, Devi & Rani, Craig Stallion, Syx Toshi, SSI Seb & Heather, Namiko, GR Surfboards, Abel and all the gorgeous owners of surf sims, who make surfing possible (they are the true heroes and deserve a place in the hall of fame).